Iron Man #126, September 1979 | 'TAIN'T THE MEAT… IT'S THE HUMANITY! 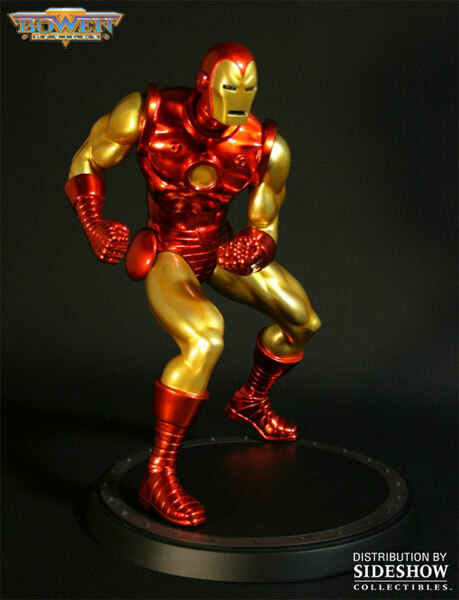 Published by Marvel Comics in September 1979 Iron Man issue #126 depicted the resolute Avenger ready for action, red and gold armour gleaming. It’s a fantastic image and easily one of my all-time favourite comic book covers. Pencilled by John Romita, JR and inked by Bob Layton this cover is both eye-catching and powerful. 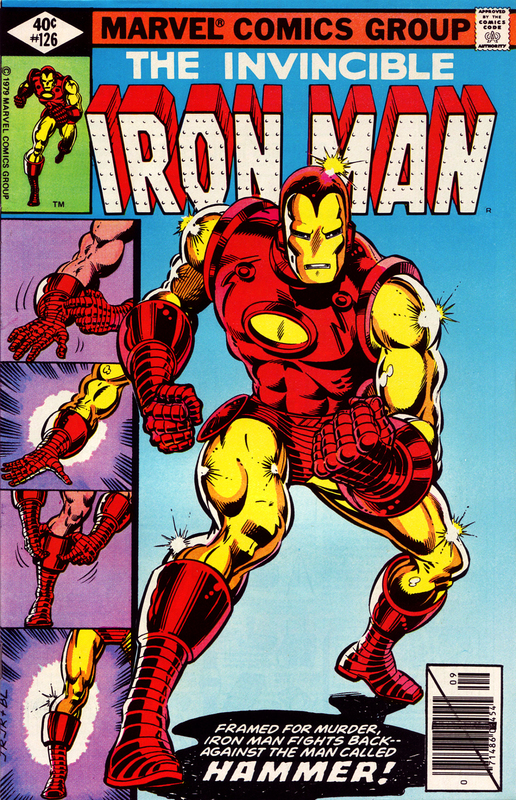 At a time when comic book covers usually depicted a scene from the issue itself this cover set itself apart by showing Iron Man at his absolute best; these days heroic pose covers may be the norm but 25 years ago this cover really stood out from the crowd. I remember spending hours copying the drawing when I was a kid, but no matter how hard I tried though I just couldn’t get the legs right. (Although in fairness to my 10 year old younger self neither could Romita — that back leg is definitely a bit wonky). The heroic nature of the cover contrasted nicely with that of issue #128 two months later. Instead of a heroic, battle-ready Iron Man we instead see a desperate and dead-beat Stark staring wide-eyed into a mirror. 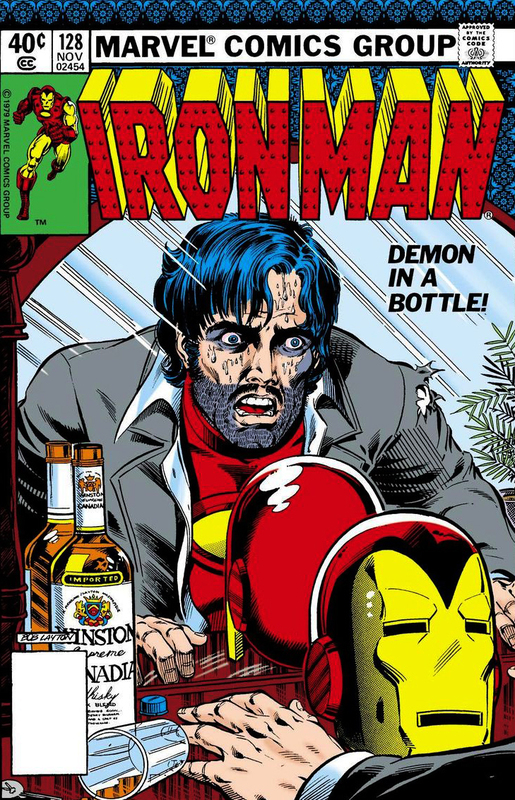 If issue #126 showed Iron Man at his best, then #128 depicted an alcohol-ravaged Tony Stark at his worse — great stuff. That story, Demon in a Bottle, was also one of the defining story lines in the superhero’s history, and one that now rightly stands as one of the greatest Iron Man stories. The iconic cover from issue #126 was immortalised as a Bowen Designs statue in 2009. I have one myself, and although the modelling is of a high quality (as you’d expect from Bowen Designs) the statue is just a little too small. A statue like this should be big and imposing, and not so… well, weedy. Still, it looks good on the shelf next to the far more imposing Hulk statue, also from Bowen.